Just how much does the original cover artwork for Dune go for these days? A lot more money than many people make in a year. If you're a die-hard Frank Herbert fan, then odds are that you're familiar with the image pictured at right. 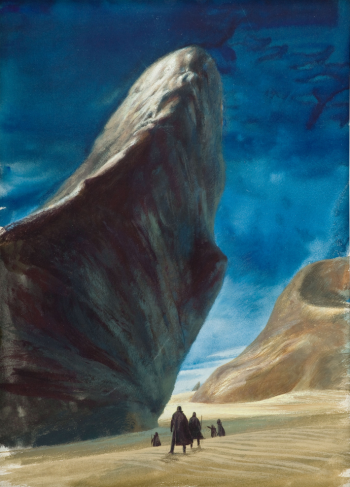 If you haven't seen it before, this is the original 11 x 15-inch watercolor painting that acclaimed sci-fi illustrator John Schonherr created for the ACE paperback first printing of Dune. Back when it was first commissioned, the illustration probably earned a decent fee, but it seems unlikely that it was worth nearly as much as the price it just fetched at an auction: $26,000. The painting was sold at Heritage Auction Galleries; pre-auction estimates concluded that the image would net somewhere between $10,000 and $15,000. Needless to say, that estimate was clearly blown out of the water. Internet bidding drove the price up to roughly $19,000 before the live portion of the auction began, and the winning bid totaled $26,290. Schoenherr's artwork was well-known to the sci-fi community: Aside from providing the cover illustrations for the hardcover and paperback editions of Dune (as well as the serializations of the novel for Analog - the magazine the story first appeared in), the painter also won a Caldecott medal for his illustration of Dragonflight and his 1975 cover of Analog is cited as a major influence on the design of Chewbacca. I'm not going to lie: If I had a ton of cash just lying around, I'd be pretty tempted to pick up an iconic piece of science fiction art like this. Sadly, I don't, so I think I'll stick to matting my 1980s comic books and sticking them on my wall instead.